Are your meals slow and savored or fast and furious? When it comes to fat loss, the answer may be more important than you think. We spend a lot of time in the fitness world obsessing over "what" and "how much" when it comes to nutrition. We're all familiar with the basic guidelines of eating protein every few hours, choosing high-fiber carbohydrates and healthy fats, and enjoying all food in moderation. But how you eat is almost always overlooked, which is a shame. Scarfing down your food isn't just ill-mannered and a turn-off for anyone around you; it can impact your goals to a surprising degree. The good news is that you can correct it—today! We can all recall a time when we ate something too quickly. Maybe it was inhaling Grandma's blueberry pancakes or scarfing down a sandwich before a meeting. Maybe you're doing it right now. Researchers have concluded that eating like this can actually override your body's satiety signals—such as the fullness-inducing hormones neuropeptide y and glucose-like peptide 1—that tell your brain it's time to stop eating. [1,2]This can leave you hungry and ready to eat more a short time later, despite having just guzzled hundreds of calories in a mere few minutes. Choosing to hold your horses when it comes to taking that next bite may in fact work to reduce your food intake. However, choosing to hold your horses when it comes to taking that next bite may in fact work to reduce your food intake. A study published in Psychosomatic Medicine examined various eating speeds amongst nonobese and obese individuals. Not surprisingly, when subjects were instructed to eat at a fast speed (think "two minutes before your next meeting" fast), they consumed more total calories. In further support of slowing down, other studies have found a decrease in overall food intake with a reduction in eating rate. If you're a hardgainer who is desperately seeking calories, this could be music to your ears. But if weight loss is your goal, consider it a signal to slow down. So what does this difference in speed look like in action? To answer this, researchers from Texas Christian University performed a study in which they observed 70 individuals—half of them overweight, half not—who were instructed to eat ad libitum from a large portion of pasta with peppers, onions, garlic, and olive oil. They were also provided with 12 ounces of water per meal. Each subject went through both a fast- and a slow-eating protocol separated by a four-day washout period. During the fast phase, they were prompted to eat "as if they were on a time constraint" and to "take as big a bite as possible." When subjects participated in the slow phase, they were prompted to chew each bite thoroughly and set their utensil down between bites. Researchers observed and prompted subjects appropriately throughout each phase. The results of the study were eye-opening. On average, the fast eaters consumed their meal in nine minutes, whereas the slow eaters consumed their meal in 21 minutes. The fast eaters consumed an average of 102 calories per minute, versus 39 calories per minute for the slow eaters. Over the course of the meal, the fast eaters consumed 99 more calories than the slow eaters did. That may not sound like much, but if you're accustomed to eating that way daily—or even two or three times a day, as many people no doubt are—it could quickly add up and negatively influence your body composition. Another interesting element of the TCU study was that subjects were asked to rate their hunger at several intervals following the meal. The fast-eating group reported hunger sooner than the slow group, even though the fast eaters had eaten more at the previous meal. How can we explain this? One possibility is that the slow group drank more water than the fast group, usually while they placed their utensils down between bites. In fact, the fast group's water intake was only 80 percent of the slow group's. This is important because the human stomach is primarily a "volume counter" rather than a "calorie counter." The stomach creates satiety signals based upon the volume of contents within, not the total calories taken in. Simply put, this means the stomach creates satiety signals based upon the volume of contents within, not the total calories taken in. Ever notice how you can eat an entire bag of chips without feeling full? The chips are easily ground to virtually nothing by your teeth, leaving plenty of unoccupied space in your stomach. Now try eating a bag of broccoli. Drinking water with a meal causes fullness much more quickly than food alone. This same conclusion also extends to so-called "high volume" foods like fruits and vegetables, which take up more space in your stomach than, say, bread or pasta. Put it all into action, and it equates to more satisfaction achieved from fewer calories. That's a win-win for weight loss! Cut food into tiny pieces, similar to the size of a corn kernel or pea. This will increase the number of bites that need to be taken, which will slow down your meal. Aim for 15-20 chews per bite. This will help send satiety signals to your brain and allow each and every taste bud to enjoy the bite. Take a sip of water between bites, or enjoy some conversation. Setting the fork down between bites of your juicy steak will allow you to savor the flavor longer! In an effort to promote fullness, drink 12-16 ounces of water just before your meal. This will give your body a head start toward feeling full and help to reduce your intake. Along with their ample amounts of micronutrients, fruits and vegetables contain plenty of water and fiber, both of which are high volume and can help you stay full. Implicit in all of these tips is another idea: if weight loss is a serious goal of yours, regular ad-libitum eating might not be the best approach. Implicit in all of these tips is another idea: If weight loss is a serious goal of yours, regular ad-libitum eating might not be the best approach. Even the best of us are prone to occasionally inhaling a meal, but if you're confident in the calories and macronutrients each meal contains, the potential for overindulgence is far slimmer. Likewise, you could limit the majority of your ad-libitum eating to certain types of foods. Plenty of people who otherwise count their macros consider raw vegetables to be "free," for instance, for the reason that they increase nutrient intake and fullness. Even with that approach, though, there will be times when you have an immense spread of decadent food in front of you—hopefully along with some good company. When this happens, make the most of the experience by taking your time and savoring each bite. These speed hacks are excellent to use for get-togethers and celebrations in which food is the focal point. In a world in which we are always attempting to become faster in every endeavor we pursue, take a minute—or twenty—to enjoy a meal at a comfortable pace. De Silva, A. & Bloom, S.R. (2012). Gut Hormones and Appetite Control: A Focus on PYY and GLP-1 as Therapeutic Targets in Obesity. Gut and Liver Journal, 6(1), 10-20. Kaplan, D.L. (1980). 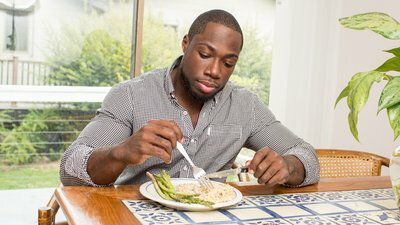 Eating style of obese and non-obese males. Psychosomatic Medicine, 42(6), 529-538. Smit, H.J., Kemsley, E.K., Tapp, H.S. & Henry, C.J.K. (2011). Does prolonged chewing reduce food intake? Fletcherism revisited. Appetite, 57, 295-298. Rhea, D., Shah, M., Copeland, J., Dart, L., Adams-Huet, B., & James, A. (2014). Slower Eating Speed Lowers Energy Intake in Normal-Weight but not Overweight/Obese Subjects. Journal of the Academy of Nutrition and Dietetics, 114(3), 393-402. doi: 10.1016/j.jand.2013.11.002. Scisco, J.L., Muth, E.R., Dong, Y. & Hoover, A.W. (2011). Slowing bite-rate reduces energy intake: An application of the bite counter device. Journal of the American Dietetic Association, 111(8), 1231-1235.